The No Anglican Covenant Coalition was created by a group of people from across the globe who are passionate about the Anglican Communion. We chose a name cast in the negative to make it clear just where we stood, but everyone should know that we are passionate believers in the Communion. Our opposition to the proposed Covenant reflects our sincere belief that its adoption would be a profound mistake and, contrary to its ostensible goal, would divide, rather than unite the churches of the Anglican Communion. We rejoice in being part of a worldwide communion, rather than a worldwide church. This fact allows each member church to proclaim the gospel in a manner that is most meaningful in that church’s own cultural context, while maintaining recognizably Anglican practices and Anglican ethos. We believe that widespread adoption of the Covenant would take us far down the road of establishing a worldwide church espousing uniform doctrines. Such a church can be maintained only through impractically complex and expensive consultation and decision-making or through rule by an all-powerful elite. The former has never existed and perhaps never could exist. The Roman Catholic Church is an example of the latter. The Church of England chose a different path from the Roman church 500 years ago, and we believe that the wisdom of that decision is still apparent. Universal adoption of the proposed Covenant seems increasingly unlikely, assuring that our somewhat fractious Communion faces a split into tiers, communions, or what have you. The resulting fragments will invariably become hostile toward each other, and those churches bound by the Covenant will become a tentative and suspicious assemblage, more concerned with policing fellow churches than proclaiming the Gospel. One need only review the history of the Communion over the past decade or so to realize that such a future is likely if the proposed Covenant achieves significant acceptance. It will, after all, change no hearts, but it will facilitate the meting out of punishments to sister churches and the further splintering of our once strong fellowship. The members of the No Anglican Covenant Coalition, believe that strengthening the Anglican Communion must be done by fully embracing its unique attributes, not by radically redesigning its structure and circumscribing its beliefs. Anglicanism has been characterized by rich liturgical and musical traditions; by acceptance of the ancient creeds and practice of the dominical sacraments; and by the reliance on scripture, tradition, and reason to guide our actions. This has proven to be a formula for creating vibrant and effective churches everywhere on the planet. We have neither a single world culture nor definitive answers to all theological questions to justify a unified world church that we might call Anglican. We remain, then, enthusiastic Anglicans, delighting in our somewhat messy fellowship of churches united, albeit imperfectly, by bonds of affection and, more importantly, by our desire to proclaim the Good News of Christ’s redeeming work of salvation to all the world. 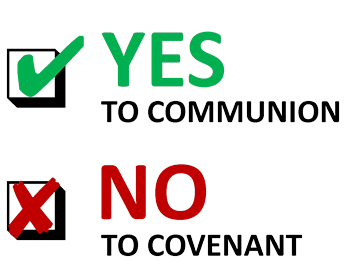 We invite all Anglicans to join with us in saying “Yes” to communion, but “No” to covenant.